Tour goers see a no-water landscape, well established, with natives, pollinators, and birds flourishing. Exploring the touch and feel of a no water use diamondia lawn. #1: Start by REDUCING your water use! Get rid of your thirsty landscape so you don't need water in the first place. This doesn't mean artificial turf, gravel and cactus, or hardscaping. Property value can be preserved with the right plants in the right places and some well directed rainwater! This outdoor shower came into being after deciding that getting to the piping in the slab was too cumbersome. Investing in a beautiful shower space where the water drains right to the garden proved a better investment! #2. PLANT THE WATER FIRST! If you are preparing your landscape for redevelopment and you want to make the best use of your water resources, before you decided on plants and a design, figure out what greywater and rainwater potential you have. Create a water budget. Design your plantings to use the the easiest water to access and at the volumes that are plant appropriate. #3. GET CREATIVE! Sometimes, if you can imagine changing some personal habits a little or altering your routines, your water distribution will be more effective! #4. USE SMALL SPACES FOR BIG IMPACT! This can look like many things, but often looks like a 205 gallon tank instead of a 55 gallon barrel. 4 x 205 gallon rainwater tanks in this small sideyard add up to 800+ gallons for fruit trees to make it through the summer. #5. GET THE COMMUNITY INVOLVED! 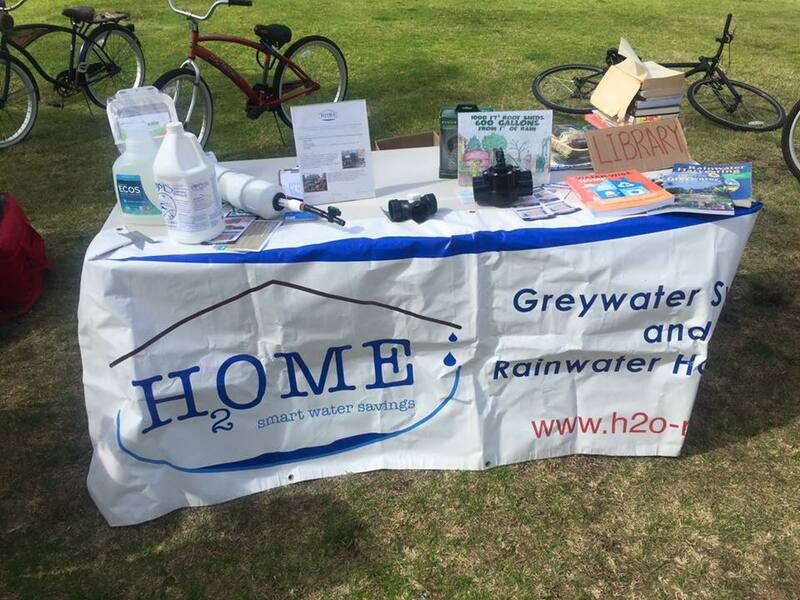 Getting your neighbors and friends involved can make short work out of a greywater or rainwater installation! Host a workshop! After hosting a laundry to landscape greywater workshop, this home, featured on the tour showcased a thriving orchard with a 50% water reduction! Good work for neighbors of all ages. #6. It's not rocket science! You can often DO MUCH OF THE WORK YOURSELF. You just have to learn what your resources are, and make sure you get it done right! Connect with a local expert for a consultation, take their recommendations, and use them as your resource along the way. Buy a good book and follow the instructions. Learn about water budgeting. Take a class and make a friend to skill-share with to get the job done. #7. LOVE THY NEIGHBOR! Sometimes your neighbors don't want to do what you are doing, but you'd be surprised how they can contribute if you just ask! Like one family who is borrowing their neighbor's downspout to fill their 1320 gallon rainwater tank. This 1320 gallon rainwater tank catches water from the neighbor's garage roof! #8. COOPERATION IS THE KEY TO ABUNDANCE! In our community we have some amazing resources! You don't have to do everything yourself, and often times we all benefit from working together! At our last home, between Ecology Artisans, Good Neighbor Gardens, H2OME, and Garrison Construction we turned a typically south park lot into a food forest with abundant veggie gardens and cut the water use in half! This 1320 gallon rainwater tank keeps several raised boxes of veggies feeding the homeowner and her neighbors through a local CSA program. #9. GROW FOOD! Did you know that your water footprint takes into account the food you eat. If your food is grown outside of San Diego, your water footprint is higher. Growing food in your own backyard with onsite water (rainwater for veggies, and greywater for fruit trees) means that you aren't wasting oil to bring the food to San Diego and water, usually imported to grow your food. #10. We are ALL part of the solution to creating local water in San Diego. If all homeowners in San Diego reduced landscape irrigation by 50% using an integrated approach to onsite water management, we would decrease our imported water needs by 20%, more than twice what the Carlsbad desalination provides for our county by much more energy intensive methods! Plus by rerouting our rainwater into our gardens, we offset stormdrain pollution and by rerouting our greywater into our soil, we offset costly infrastructure upgrades to wastewater treatment facilities! Join the movement!